I got to thinking one day as I was rinsing out an empty milk jug, getting ready to use it for something other than holding my milk, "Do most people just throw this away and not give it a second thought?" Because most things in my house get used for two or three different purposes before I reluctantly think I've used it for all I can and toss it in the garbage. And my next thought was, "Wouldn't it be neat to have a regular feature on my blog letting people know the different ways they can reuse ordinary household items to get every frugal bit of life out of it before it heads to the overcrowded landfill?" So....ta da! A new feature was born. Every week I'll put up a post called "10 Ways To Reuse It" hopefully to get your mind creatively thinking of ways to reuse what you might have thought was all used up. If you have an item you'd like me to feature, send me an email and I'll come up with some ways to use it up. I think most of us empty at least one milk jug a week. Did you know that when you throw them away and they get hauled to the landfill they just sit there, never decomposing? So why not give them new life? Make them work for you to organize your life, store your stuff, or put a smile on your kids faces. Here are a few ideas. When you thaw meat in the fridge does it sometimes leak all over your shelves? Cut the top off your milk jug and use the plastic bottom to thaw your meat in. No more leaky juices and you can wash and reuse it numerous times. Use the top part of the milk jug as a funnel. Cut a hand size hole in the top of the jug opposite the handle and use it to store dog biscuits, golf balls or clothes pins. A full freezer is an efficient freezer. Wash out and fill your milk jugs with water and store in your freezer. When a freezer is full it takes less energy to keep it cold. 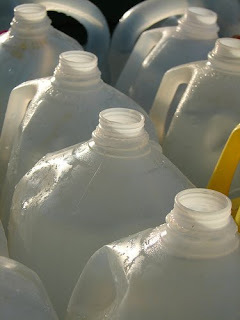 Water expands though so leave a little room at the top of your jug when filling or the container will crack. When you're camping pull one of your water jugs out of your home freezer and use it to keep your cooler cold. Cut a hole in the top opposite the handle and use to store your toilet brush in. Cut the top off right where it starts to widen, put some gravel in the bottom and set a tea light in it for a beautiful glowing luminary for outdoor parties. Fill with your bulk grains. Wash out and let dry really well and then store rice, beans, or cornmeal in them. They are easy to pour out and measure too. Cut the bottom off and shape it into a scoop with a handle. Use it to scoop out dog food or even for the kids to use in their sand box. To check out WFMW go here. cool! I get my milk in glass jars from the farm, but I do have two uses to add. One I used as a child quite often - gopher catcher. We would keep milk jugs of water in the garage, and when we saw a gopher run down a hole we would grab a jug and place it upside down on the hole. The water would go down, and the gopher would come up. The second is, I have heard of people using them to store homemade laundry soap. You can also use them as little "greenhouses" when setting new plants out. (And the nights are still chilly.) Just cut out the bottom, remove the lid and set over the plant. Just don't forget to take them off when the sun comes out! How fun. Thanks for the tips. I never thought about a full freezer using less energy. Great idea. I have never thought about using them for my bulk food!.. Ya learn something new every day! thank you :) I like your new feature! I love these ideas! One other idea for leftover milk jugs: in the garden, for just coming up plants like green peppers, cut off the bottom of the jug and put the top over the little plant -- without the cap on it. This will provide protection from the wind and rain and sometime cool temperatures that could damage or kill the plant, and also let excess heat from warm days escape through the open milk jug top. Once the plant grows to reach the top of the jug, it's time to take it off. Those are some great ideas! We use milk jugs to hold loose change, we made a windsock out of one, and I'm planning to use one to "plant" near my tomato plants in the garden to slowly release water. Family Fun magazine also has a really cute craft you can make using milk jugs to make a garden "flowers". I didn't know they never decompose. We are saving our milk jugs to make an igloo for our boys to play in outside. Friends are saving for us, too. We saw one at the public library and it used spray foam insulation to make the jugs stick together. We will probably spray paint it in camo colors so all the neighborhood kids can play in our fort/base. Make an Easter basket! Cut out a large hole opposite the handle. Leave at least a one inch lip at the bottom. Using a paper hole puncher, punch holes all along the edge of the hole every inch or so. Make tissue paper flowers with pipe cleaners and tissue paper. Thread the pipe cleaner ends through the holes and twist to secure. Fill the bottom with Easter "grass". You can stop here, or our favorite way to decorate the top of jug: Get a two inch styrofoam ball hot glue to opening of milk jug. Decorate the ball to be your favorite animal (ie: add ears, googly eyes, and cotton ball cheeks for a bunny or googly eyes and a yellow felt beak for a duck). Voila! sturdy Easter basket! Cut the top bit off above the handle, String some twine through the handle and sling it across your body, messenger bag-style. Berry picking basket! Great ideas! I usually just put my milk jugs in my recycle bin so they get recycled. I posted today about reusing ice cream pails! Love this idea Gayle! I am always changing little things to be more frugal and more green. I've never thought of putting my grains/rice in jugs, GREAT idea and one I'll use this week for sure. Thanks! what great ideas...thanks for sharing! Love the new feature, what a great idea! I love this idea! I have 2 milk jugs that go in the trash every week so I could definitely re-use! Your ideas remind me of my parents. We never tossed milk jugs in the trash. My parents put water in them and kept them in the freezer. We'd use the ice for coolers while camping, for making homemade ice cream, and so on. This feature is a great idea Gayle. There are so many ways to resuse things! I use my milk jugs to store homemade cleaners, etc, though I usually just recycle them, as we go through too many around here for me to use them all! Fill one with water and keep in the fridge for cold drinking water anytime. Store homemade laundry soap in them since they are easy to pour. I love these ideas and look forward to this kind of post each week. Thank you for the inspiration! makes some great toys made from recycled milk jugs! Luckily I can recycle them. i too recycle my jugs, but save back a few every once in awhile. 2. rinse VERY well and fill with filtered water from home and take our own FREE drinking water when we camp or travel. I love reading about new ideas on how to reuse old things! I'm so glad you are doing this. I usually recycle my milk jugs,(we seem to go through 2-3 gallons a week), but I do like to reuse them for premixing plant food for my potted plants. You have a wonderful and helpful blog! Thanks for all the great info! I do try to re-use many items and some of these ideas are great. But I am also lucky enough to have curb side recycling - we are able to keep many items out of the landfill every week. If we all tried to re-use and recycle thing how much less garbage there would be. Now everyone brings their own grocery bags right :) Also coffee cans are great storage or used as banks - paint the can - cut a slit in the top! Also cut the bottom off and use them as paint trays for the kids craft projects. Great post! We don't have too many milk jugs in our house but I do have 2 full ice jugs in the freezer now that the contents are getting a bit slim. Hi I love the new "blog about reusing things in your home mmy girlfriend and I were just talking about that! I like the idea about dried grains but can you really get all the milk cleaned out? I store them in the freezer too, but I also fill them add a couple of drops of bleach and put them in the celar but not for drinking but for "bathing or flushing tollets, if you lose power or water. It has come in handy already. Keep up the good job! I've also used milk jugs for storing homemade iced tea or lemonade in, too. They could also be used for my homemade cleaners that I make in bulk. Although I usually recycle my milk plastic, reusing them before that is a really good idea and saves me from buying containers. really...if you don't want them to sit in a landfill, why don't you recycle them and then they will REALLY get turned into something useful...all while saving the planet. Great ideas! Catch rain water in a tub and store in the Milk jugs. Great way to water the flowers on those hot, dry summer days! This will also help keep the water bill down too. I have one idea I don't think has been mentioned! Use them to make your own organic plant food. Fill the milk jug with grass clippings and water. Leave the bucket outside for two weeks (three if the weather has been cold) And strain out the remaining plant material and drop it on the compost heap. You will find that you now have a rich, stinking liquid that your plants will just love. Dilute with 6 parts water to one part feed and use it to boost flowers, tomatoes and any garden plants that need a helping hand. The smell will disappear after about 10-15 minutes. i really loved those tips.. thanks for sharing such great ideas.